Chris Joyce and Derek Varney, Joyce Landscaping, Marstons Mills, Mass. To recruit and retain workers, smart landscape companies leverage culture, compensation and technology. Every morning, Chris Joyce greets every one of his employees. He stands in the parking lot, shakes their hands and says “hello” to each member of the team, which amounts to about 140 people in the summertime. 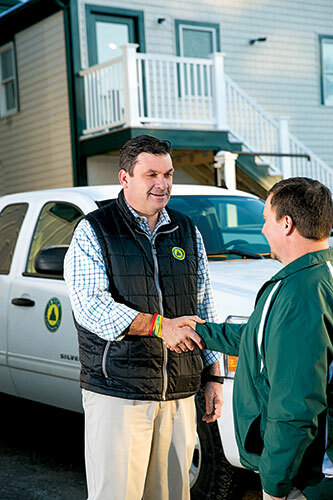 “I’ve been doing it since when I started and only had one employee,” says Joyce, owner of Cape Cod-based The Joyce Cos., a landscape, lawn care and irrigation provider with about $13 million in annual revenue. “It’s so important to start the day on a positive note, that’s why I continue with it today even with a much larger company,” he says. Joyce’s company has been—and would like to continue—expanding at 8-15 percent per year, but it can only do so if it gets the people it needs to support the growth. It was about two or three years ago that “someone turned the water off” on the new applicant faucet, he says. He’s not the only one feeling the pain. Bruce Wilson, LM columnist, industry consultant and part-owner of Conserve LandCare in Thousand Palms, Calif., says it’s a widespread concern. He operates landscape industry peer groups with about 45 member companies of various sizes. “I’d say 90 percent of those are struggling to find people,” he says. A study released by the National Association of Landscape Professionals Foundation last June showed 60,000 professional level positions and 240,000 labor positions in the landscape industry would need to be filled within the year—with the average company looking to add 17 laborers and one manager. Three-quarters of respondents said it was “very” or “somewhat difficult” to find qualified executives, managers and project managers with two-thirds saying the same about laborers. With federal unemployment at 4.9 percent, compared with a 10 percent rate during the height of the Great Recession and its aftermath, the recruiting and retention game isn’t going to get easier anytime soon. One thing’s for sure, employers have to get creative. Whether they’re going all in on culture, pay or technology, smart landscape company owners are experimenting with ways to become the employer of choice. Landscape professionals aren’t surprised the labor market has tightened as the economy has slowly but steadily recovered from the recession. In 2009 there was one job opening for every 6.2 unemployed job seekers, according to an Indeed.com report citing data from the Bureau of Labor Statistics (BLS). In 2015, there were only 1.7 unemployed job seekers for every vacancy. Though they’re not surprised, landscape employers are coming to terms with how conditions have changed in the industry from a decade or two ago. There are many hypotheses about why there’s a lack of workers in the trades and service industries in particular. Some bemoan an “entitlement” generation unwilling to do hard work. Some say there’s too much focus on getting a four-year degree, which discourages some kids from learning a trade. Some point to the pay levels in the landscape industry, which, depending on skill level, straddle the national median annual wage for all occupations of $35,540, according to the BLS. The median hourly wage for landscaping and groundskeeping workers was $11.68 ($24,290 per year) in 2014. Median salary for first-line supervisors of landscaping, lawn service and groundskeeping workers was $20.75 ($43,160 per year). Similar industries like construction pay higher and pull away some potential applicants. Wilson says one reason it seems so difficult for some companies to find laborers is companies today simply need more workers because they have the ability to grow much faster than they did in decades past. He says current growth levels were “unheard of” in the 1990s. Facilitating this growth is access to financing. Even though it might be difficult to get a bank loan, it’s easy to lease or finance equipment, freeing up cash to fund growth, Wilson says. Immigration and guest-worker policies also have had an impact. Contractors surmise there are fewer illegal immigrants working in the industry now than decades ago. These circumstances reduce the supply of legal workers, says Frank Mariani, CEO of Lake Bluff, Ill.-based Mariani Landscape. “Without a doubt, there is a huge labor crisis, especially if you try to live by the rules of the federal government and hire legal employees or use a guest-worker program,” Mariani says. Speaking of the latter, the H-2B guest-worker program has had a few rocky years, causing many companies—like Mariani’s—to forgo using it due to administrative problems. Mariani Landscape, an approximately $40 million company, used the program from the early 2000s until a few years ago when it didn’t receive any of the workers it was anticipating. Yet, the landscape industry continues to be one of the largest users of the program, which has been embroiled in federal regulatory and legal hang-ups. Visa levels are at half the number of those issued during peak prerecession years. That said, there may be an uptick this year, as returning workers (H2R visas) are being permitted, which hasn’t been the case since 2007. In Texas, the labor situation has been difficult during the past few years due to a strong state economy, says Ben Collinsworth, CEO of Native Land Design, based near Austin, Texas. Last year, the company’s workers were delayed eight weeks, which created two months of seven-day workweeks for the rest of the team. Even with 100-120 H-2B workers expected this year, thanks in part to the returning-worker exemption, work will go undone. “There’s very little to no chance we’ll fill all the slots we need to get the work done,” Collinsworth says. At peak, the $10.6 million company will have 200-225 employees. At the same time, another government factor has come into play, potentially affecting the size of the labor pool: E-Verify. E-Verify is the federal government’s web-based system that compares information from an employee’s I-9 form to data from U.S. Department of Homeland Security and Social Security Administration records to determine employment eligibility. It was launched in 2007 as an update to the Basic Pilot Program. As of 2015, more than 600,000 employers were enrolled in the system, compared with less than 25,000 who used Basic Pilot at its peak. Nine states mandate employer participation in E-Verify; others do so only for public employers or public contractors. Many companies elect to use E-Verify on a voluntary basis. It’s difficult but worth it to hire under these restrictions, Bland says. Bland Landscaping is also paying more—he estimates it’s 10-15 percent more than a few years ago. 2 Comments on "Employer of choice"
Great article. Great in-depth perspective.